Julian Green had his transfer from Bayern München to VfB Stuttgart announced just before das Spitzenspiel in the Bundesliga between Bayern and RB Leipzig. It might be just the move the young US national team player needs to finally get his career going. 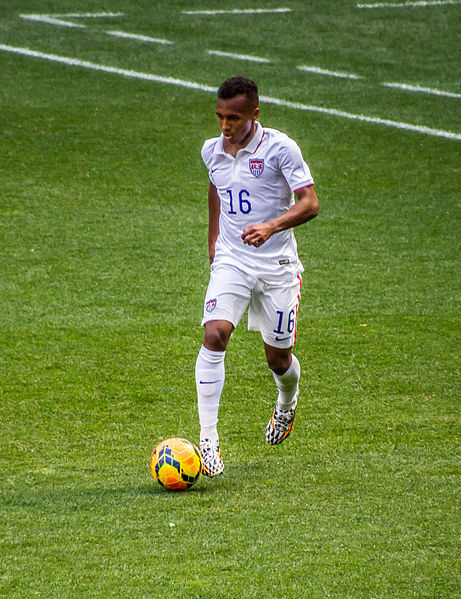 Julian Green’s still young career has been one of promises. Born in Tampa, Florida, to an American father, and a German mother, Green spent the majority of his life in Bavaria. Green played for FC Miesbach, and SG Hausham, which are both located just south of Munich, and was spotted by Bayern’s scouts in 2010. It was during Pep Guardiola’s first year at the club, in November 2013, that the then 18-year-old signed his first professional contract with the club. Within just one month he could call himself world champion, as he was part of the Bayern squad that won the 2013 FIFA World Club Cup in Morocco by defeating Raja Casablanca 2-0 in the final. Julian Green, however, had not played a single minute against either Guangzhou Evergrande in the semi-final, or later in the final against Casablanca. In some ways, the World Club Cup would foreshadow the rest of his Bayern career. The obviously gifted forward—he has scored 25 goals and given 12 assists in 51 Regionalliga Bayern games (fourth division) for Bayern II—has never really been able to break into Bayern’s first team over the last few seasons. Despite the fact that he had rarely played for Bayern’s first team, however, former US national team coach, Jürgen Klinsmann, saw the obvious talent of the attacking player, and tried to bring him in to the US team in November 2013, even though he was not yet fully established in Bayern’s first team at this point. Green was reluctant to play for the US at first, as he had played for Germany’s youth teams up to this point. But he then filed for making the one time nationality switch to play for the United States in March 2014. When asked about his decision, Green explained that he was born in the United States, and that he still felt deeply rooted in the country of his father. While those are nice words for the fans, Klinsmann’s promise of a spot in the USA’s 2014 World Cup squad was probably the true reason that Green to made the switch to the country of his father. Perhaps Green believed that playing on the biggest stage would improve his chances of gaining more regular playing time at Bayern. Indeed, Green had a good World Cup, and he even became the youngest goal scorer in US history when he scored on July 1st against Belgium in the round of 16. But back in Munich, Green was still looking in from the outside. Furthermore, Bayern had recently signed Robert Lewandowski from league rivals Borussia Dortmund, which made it unlikely that Green would receive much playing time at Bayern. Green, therefore, requested a loan move to Hamburger SV. Hamburg, at the time, was once again in the middle of a rebuild, and the club hoped that the talented forward could ease the club’s goal scoring problems. Instead, he played just 113 minutes over five games at Hamburg during the 2014-15 season. Green later criticized the club for never giving him a real chance. But Hamburg was probably never the right club for a young talented forward who needs time to develop. Die Rothosen battled against relegation all season, and went through three coaches before they were saved in the relegation playoffs. Back in Munich, Green hoped he could make an impact with Guardiola at Bayern München. But the Catalan coach more or less ignored the forward, who spent the entire season with Bayern München II in the Regionalliga. In some ways, Green was almost the forgotten man at Bayern. That was until Carlo Ancelotti included him in Bayern’s squad that travelled to the United States to take part in the International Champions Cup in the United States. Bayern, in many ways, used the US national team player as a poster boy during their tour of the United States. But more importantly, he was playing, and he was playing well, scoring a hattrick in 35 minutes in a 4-1 victory over Inter Milan. It was a brilliant performance by the young star, who seemed to relish the chance to show his potential. There had been talk that Bayern could bring in an additional forward to back up Robert Lewandowski, but with Green’s apparent potential, the club felt that there was no need to sign a new player. When the season did, however, kick off Green still received very little playing time. In fact, he only played twice, both times in the DFB Cup, where he become the first American to score for Bayern in a competitive game against FC Augsburg. With his playing time limited, and with Lewandowski’s unreal ability to stay injury free, Green must have finally felt that it was time to leave Bayern. Can Julian Green get his career kick started in Swabia? It was, therefore, not a big surprise when, on Wednesday, Stuttgart announced the signing of the 21-year-old forward for €300,000. Stuttgart were relegated to Bundesliga 2 at the end of last season, and while die Schwaben are currently in third place, and on even points with second placed Hannover 96, Stuttgart have looked somewhat inconsistent in recent weeks. On matchday 16 Suttgart gave away a 1-0 lead against Hannover in the dying moments of the game. Then on matchday 17, they were heavily defeated by the Würzburger Kicker. The results have given the leadership of the club cause to worry that direct promotion could be under threat (only the first two teams go up directly). “The focus is on bringing in young and talented players, who we can form into Bundesliga players—players who can be developed, and also can help us in the short term. But also players, which is more important than anything else, who have a natural winning mentality.” Schindelmeiser hopes that Green can bring the mentality to turn Stuttgart into a winning side, and can give the club the necessary push to gain promotion. Green’s qualities are undeniable. The young American is a rocket, a fantastic player, an athlete with immense abilities. At the same time, he has failed to gain a starting place at both Bayern and Hamburg. But in fairness, Bayern was probably a step too far for him at this point in his career, and Hamburg was probably not a nurturing environment for the young and talented forward. In fact, as I pointed out in the World Football Index Bundesliga – Gegenpressing Podcast on Wednesday, the drop to the second division could be exactly what Green needs to kick-start his career. The Bundesliga 2 is a fantastic place for young and upcoming talent, and Stuttgart, in particular, has a great reputation for turning talents into stars.